West Nottinghamshire College brought some Brazilian magic to Mansfield by staging its own version of the FIFA World Cup. 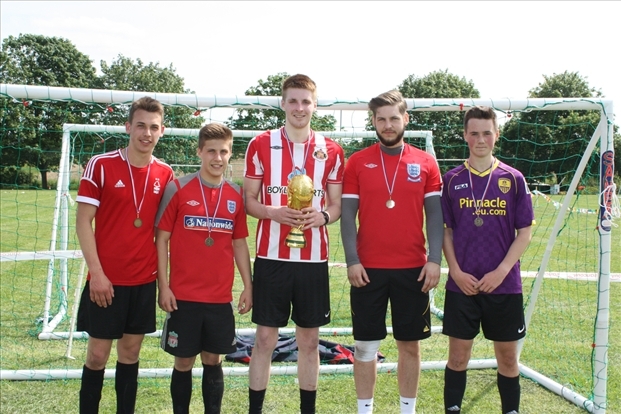 The ‘West Notts World Cup’ saw 24 teams made up of more than 160 students and staff battle it out on the sports field at the Derby Road campus for a chance to claim a replica of the famous trophy. Organised by the college’s sports development team, the tournament provided a timely twist on its usual end-of-year sporting celebration, the Olympic-themed ‘Vision Games’. Each team, named after one of the qualifying nations for the real World Cup, competed in a series of eight-minute group games, with the group winners and runners-up progressing to the knock-out phase. ‘Honduras’, made up of Level 3 sport and exercise science students Joe Martin, Josh Smyth, Scott Mills, Oliver Bennett and Liam Burley, were crowned college champions after beating ‘Bosnia’, consisting of staff from college subsidiary company bksb, 1-0 in a keenly-contested final. Meanwhile, the Students’ Union brought a flamenco flavour to the festivities by holding a World Cup-themed carnival featuring face-painting and games. Spectators also tried out power-chair and visually-impaired versions of the beautiful game courtesy of taster-sessions inside the college’s new sports hall. The event, on Friday 6 June, was supported by Nottinghamshire FA, the Wheelchair Football Association and Nottinghamshire Powerchair Football Club. Rob Shaw, of the college’s sport development team, said: “The tournament created a real buzz and excitement among students and staff and it was great to see all the hard work and planning come to fruition. “Everybody fully-embraced the carnival atmosphere by getting involved in all that the event had to offer, which has raised anticipation of the actual World Cup. Caption: Level 3 sport and exercise science students (from left) Joe Martin, Josh Smyth, Scott Mills, Oliver Bennett and Liam Burley, playing as Honduras, were crowned college champions after winning the West Notts World Cup.